October is one of my favorite months of the year. The air is crisp (well, some days here in Texas), the sky and light changes, you can buy pumpkin spice everything, and of course Halloween! One of my favorite traditions to ring in the holiday season is to explore one of the city’s haunted houses. Even though I will be scared around every corner and lose my voice from screaming in my poor husband’s ear, I put my nervous system through this fun ‘torture’ every single year. In a way, I’m stepping outside of my comfort zone and doing something that makes me nervous. Going to haunted houses and deliberately putting myself in a situation that scares me reminds me of the importance of taking risks. It takes courage to face your fears. But once you take the plunge, not only do you feel accomplished, you grow from the experience. You gain the confidence to face other fears, and then you become unstoppable! Searching for a new job can be terrifying for many, especially this day and age. Where do I go to find a new job? Does my resume look ok? Are my skills up to snuff? How do I compare against other applicants? What are employers looking for? And on and on. Before you know it, you are overwhelmed and paralyzed with fear. So then you just end up applying to jobs and waiting for someone to call you back. It’s time to face the demons and take back control of your job search! Finding a new job requires building relationships and putting yourself out there. I know all you introverts that are reading this have sweaty palms thinking about having to attend a job fair or networking event. Trust me, I get it. That’s not my idea of a fun Tuesday either. But stepping outside of your comfort zone, even just a little, could yield great results. A client attended a Chamber of Commerce event with a friend, and at the end, she stood up and made the announcement that she was in the market for a new job. She gave her 60-second elevator speech, and after the meeting, she was surrounded by people wanting to talk to her. That takes guts! And people recognize that and want to work with someone who isn’t afraid to take on a challenge and think outside the box. My Pops always told me, you never know unless you try. Too scared to message that hiring manager on LinkedIn because you’re afraid they won’t respond? Well, they may or may not. But at least you tried! And one of those times may catch their attention. You are going above and beyond the average job seeker, and that takes courage and confidence, which sets you apart from all the others. (This method has worked for several of my clients by the way). Yes, I know drawing a parallel between being scared at a haunted house and facing your job search fears might be a stretch. But maybe being bold and fierce and standing up to those fears is just the thing you need to break through that job search rut. Step away from the computer, go get out there, and show the world who you are and all the fabulous things you have to offer! 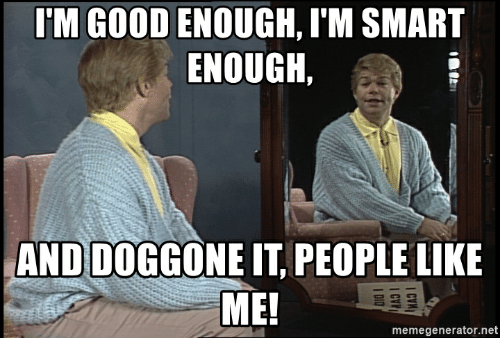 And whenever you’re feeling scared, just remember: I’m good enough, I’m smart enough, and doggone it, people like me! Peace, love, and Happy Halloween!